This is the first recipe in what will eventually be many in the Fresh Juice category. 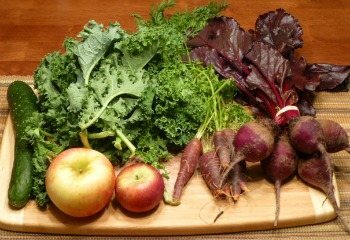 Fall is in the air and farmers are harvesting some of my favorite foods, many of which are great for juicing. On my most recent trip to the farmers’ market I couldn’t help myself and bought more than I could possibly eat in the next week. When I got home I knew I’d be breaking out my trusty Jack LaLanne juicer to make sure nothing went to waste. Freshly juiced fruits and vegetables offer many of the same health benefits as smoothies. Without the fiber they aren’t as filling, but do deliver an abundance of nutrients that can be assimilated in a matter of minutes. Fresh juice…the beets won out in the color competition. I actually got into juicing a couple years before smoothies. My primary reason was to get more fruits and veggies into my diet, which was always a challenge for me. I started by juicing apples, oranges, and carrots before mixing in greens such as spinach and kale. To my surprise, everything I juiced was super delicious as long as I had an apple or orange to sweeten. Don’t let the red color of this fall harvest juice be a turn off, it’s quite tasty. This recipe calls for more beets than normal because I had cleansing my liver in mind. 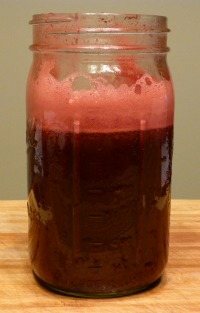 Beets are rich in butane, an excellent liver cleanser and digestive aid. Note, you’ll want to drink your fresh juice within 20 minutes as the vitamins and minerals begin to diminish rather quickly. If that’s not possible, or you want to prepare a juice for later I suggest using at least 1/2 lemon to help preserve the nutrients. Run all the ingredients through your juicer and mix well after juicing if needed. Please leave a comment below if you try this refreshing fall harvest juice. Happy Juicing! Do you use the entire beet, greens and all? Yes, Sarah, juice the entire beet. Thank you. It’s all new to me. I’ve been juicing for years (as well as making smoothies). If I used as many ingredients as you list in the Fall Harvest juice recipe, I wouldn’t be able to drink it down. Holy Cow!! That’s a TON of juice! Yes, it’s about 3 cups, Barbara. You can always adjust the ingredients for more or less.